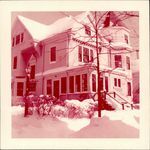 "Front left view of building at 31 Everett Street"
Photograph of the building at 31 Everett Street. View is of the front left portion of the building. The Lesley College sign can be seen to the left of the building. There is snow on the ground.